Evalute the safety and efficacy of corneal collagen crosslinking (CXL) using a transepithelial technique to treat keratoconus. Determine preoperative patient characteristics that may predict topography and visual acuity outcomes of corneal collagen crosslinking (CXL). To review outcomes of corneal collagen cross-linking (CXL) for keratoconus (KC) or ectasia in a cornea subspecialty practice. diseases and surgery of the cornea. Dr. Hersh remained on the full-time faculty at Harvard until 1990. In 1995 he founded the Cornea and Laser Eye Institute – Hersh Vision Group, dedicated to clinical care and research in cornea and refractive surgery. Because of his longstanding interest in the treatment of keratoconus, in 2002 he founded the CLEI Center for Keratoconus, dedicated to keratoconus treatment, surgery, and research. Currently, in addition to directing the Cornea and Laser Eye Institute-Hersh Vision Group, Dr. Hersh is Professor of Clinical Ophthalmology and Director of the Cornea and Refractive Surgery Division at Rutgers Medical School, and Visiting Research Collaborator at Princeton University. 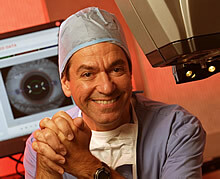 Dr. Hersh's interests are devoted exclusively to the cornea and keratoconus care. At Princeton, he works with a group investigating laser applications to eye surgery and corneal biomechanics. Dr. Hersh has participated in many FDA clinical trials of new technologies and treatments. Most prominently, he led the clinical trials for FDA approval of corneal collagen crosslinking for keratoconus and corneal ectasia, and was principal author of the published studies. Dr. Hersh has published four textbooks and more than 100 research articles and book chapters. His widely used eye surgery textbook, Opthalmic Surgical Procedures, first published in 1988, is now being revised for its 3rd edition.His other books include Excimer Laser Surgery for Corneal Disorders, Refractive Surgery, and Eye Trauma. In addition, Dr. Hersh has designed a number of cornea and refractive surgery instruments in current use, most recently the Hersh Intralase LASIK Flap Spatula. He also devised the CTAK procedure for keratoconus, a novel tissue implantation approach that is currently undergoing clinical studies at the CLEI Center for Keratoconus. 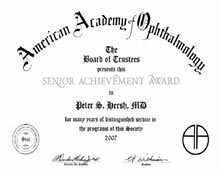 Dr. Hersh is past recipient of the Teacher of the Year award bestowed by the Harvard Medical School Department of Ophthalmology. He has trained over 1000 eye surgeons throughout the world in corneal surgical techniques. His extensive lecture schedule has taken him throughout the United States and to countries such as France, the Netherlands, China, Taiwan, India, Vietnam, Brazil, Chile, Venezuela, Portugal, Switzerland, Italy, Canada, and Korea. Moreover, he is actively involved in a number of international projects to bring education and eye care to developing countries. Dr. Hersh has been selected for Best Doctors in America for over 10 years running. He and his work have also been featured by the Today Show, PBS, America Tonight, Fox News, People Magazine, the New York Times, the Bergen Record, the Newark Star Ledger, and other national media. As a result of this philanthropic work in corneal transplantation, hew was awarded a Paul Harris Fellowship from Rotary International. Dr. Hersh is Team Ophthalmologist for the NY Jets.